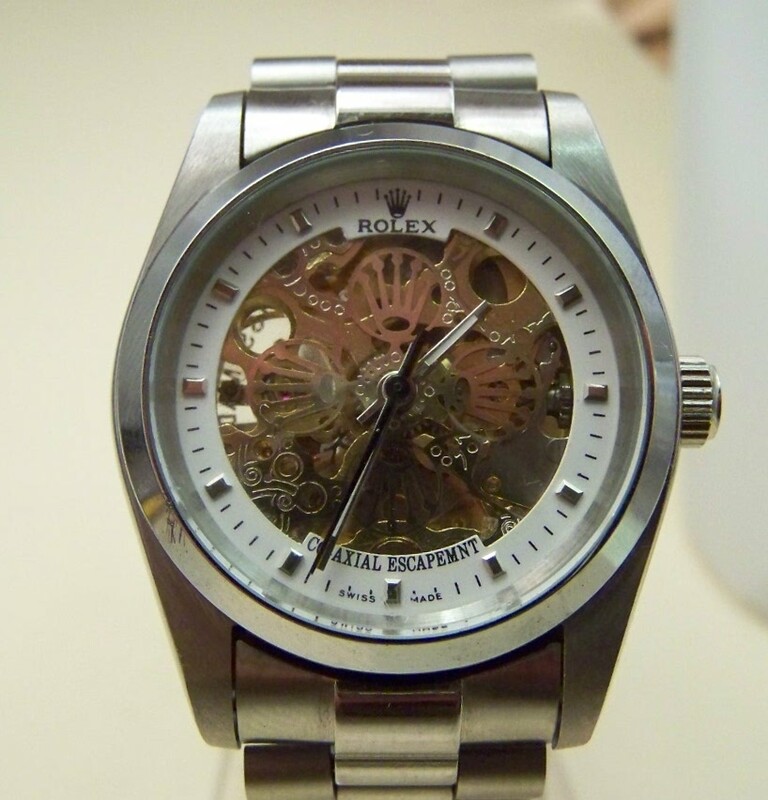 My brother in law asked me to look at a Rolex he got from somewhere, because it would not run long. He didn't have it with him. I explained that if it was real, I'm not good enough to be worthwhile, and if it was fake, it probably isn't worth fixing. Rolex fakes range from near-exact copies that are pretty much indistinguishable from the real ones without taking the back off, to slapping Rolex on whatever is handy. This watch is far closer to the latter. In its favor, it is a mechanical movement, a screw-down crown and a solid-link bracelet. However, there are lots of clues to it being a fake. It is a modern sport-style watch but it has a glass display back--only some of the Cellini handwind dress watches with square cases have a display back. 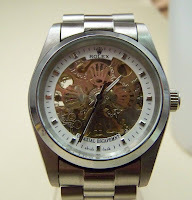 The movement is a skeleton, again not available in a sports Rolex. Tacky foil decorations taped on both sides--basically the watch equivalent of spinner hubcaps. Lettering is not nearly as crisp and even as a real Rolex. A huge clue is that the dial says "Co-axial escapement"--a trademark of Omega, one of Rolex biggest competitors. The case also has 18k markings, but is stainless steel. The back is marked "waterproof" a term that has not been used since the early 70's. I remember a vendor in Itaewon, with a couple trays of Rolexes on the street. When I told him I like the ones that keep running, he said "I have real ones" and pulled another tray out. I have to give him points for shameless hucksterism.